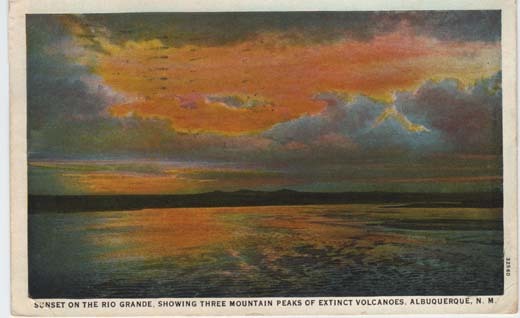 Sunset on the Rio Grande, Showing Three Mountain Peaks of Extinct Volcanoes, Albuquerque, N. M.
Sunset on the Rio Grande, Showing Three Mountain Peaks of Extinct Volcanos [sic]. 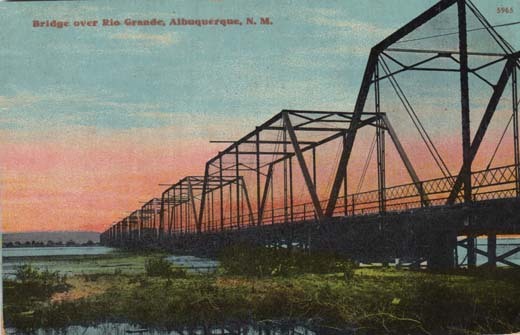 Rio Grande, the “Nile of America” at flood tide showing immense volume of water which passes Albuquerque and irrigates thousand of acres of the most fertile land on earth, that of the Central Rio Grande Valley. 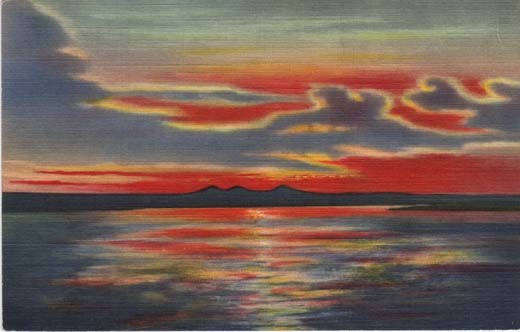 Rio Grande And Volcanoes As Seen From Air Base, Albuquerque, N. M.
Looking west from the T. W. A. Airport and U.S. Army Air Base you have a magnificent view of the Rio Grande, its two bridges, part of the Santa Fe shops and the Semi-arid Desert on the west side near the extinct volcanoes—the Rio Grande valley, however, being one of the most fertile in the Southwest. 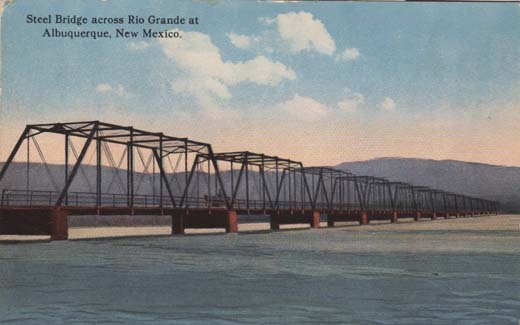 J. R. Willis, Box 665, Albuquerque, N. M.
The Rio Grande, “Nile of America” has its source in southern Colorado, thence through the famous Rio Grande Canyon near Taos, N.M., it irrigates the various Indian Pueblos along its banks. 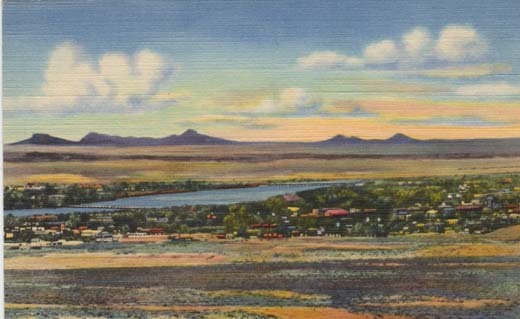 This mighty river has been harnessed to water the fertile districts in the vicinity of Albuquerque, later forming Elephant Butte Lake which supplies the rich garden lands of the Mesilla Valley south to El Paso, Texas, en-route to the Big Bend country and the Gulf of Mexico. The three peaks are the cones of extinct volcanoes. 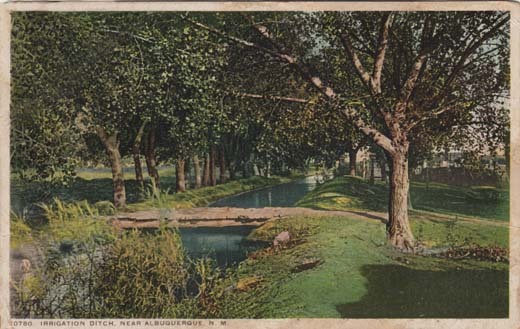 Irrigation Ditch, Near Albuquerque, N. M.
Bridge over Rio Grande, Albuquerque, N. M.
Rio Grande Bridge, Albuquerque, N. M.
Porter’s Views of Albuquerque and Vicinity. 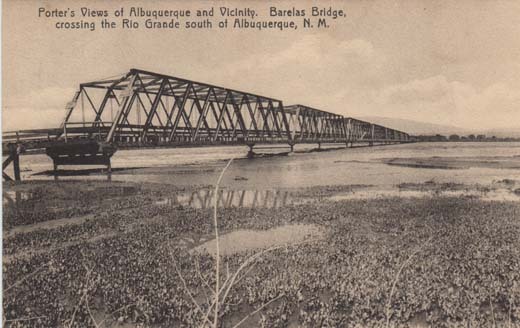 Barelas Bridge, crossing the Rio Grande south of Albuquerque, N. M.
Steel Bridge across Rio Grande at Albuquerque, New Mexico. 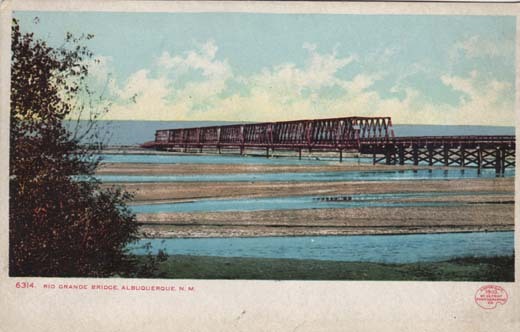 This magnificent 18 span road bridge built at a cost of $60,000.00 stands as a perpetual monument to the progressive spirit of the citizen making access easy to the undeveloped territory beyond.